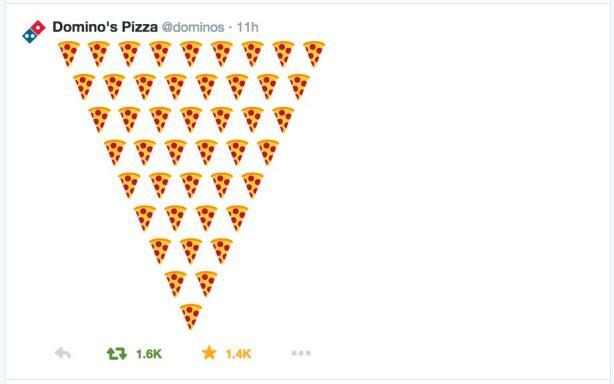 Domino's Pizza flooded Twitter with emojis this week, and with good reason. The chain is the first major restaurant in the US to let customers use them to order pizza. ANN ARBOR, MI: Longtime creative agency partner CP+B used emojis to create intrigue and excitement among fans of Domino’s Pizza on social media before going public with the chain’s plans for an order-by-Twitter service. The firm worked with its social content arm, The Post Office, to change the company’s entire Twitter feed to pizza emojis before a USA Today article posted on Tuesday afternoon about the "tweet-a-pizza" offering, said CP+B VP and creative director Matt Talbot. The system, which will allow regular Domino’s customers to order using only a pizza emoji on Twitter, will launch next Wednesday. Since the brand often uses emojis on Twitter, the firm thought it’d be fun to tweet entirely in emojis from the Domino’s handle. It posted its first pizza emoji on Monday morning, receiving more than 2,300 retweets. ?????????????????? ???????????????? ?????????????? ???????????? ?????????? ???????? ?????? ???? ?? The brand also responded to followers with pizza emojis and combined the symbols with hashtags. .@????????????? ?, ???? ?????????? ???????????? ?????????????????? ???? ????-????????? #?????????? Although some people may have thought the tweets were a mistake or "a social media manager gone amuck," CP+B believed the strategy would start a natural conversation among fans, said Talbot. Other brands such as JCPenney got in on the fun, tweeting its own emojis at @Dominos.
.@dominos ???????? + ?????????? = ?????????? Domino’s plans to do more with emojis in the future, while the brand looks for other innovative ways for consumers to order pizza, explained Talbot. The pizza chain handles communications in-house, while nearly all social media is managed internally with assistance from creative partner CP+B. Shares of the restaurant hit an all-time high last month after it revealed better-than-expected first-quarter earnings. It posted revenue of $502 million in Q1, higher than forecasts. A Domino's representative could not immediately comment on the campaign.